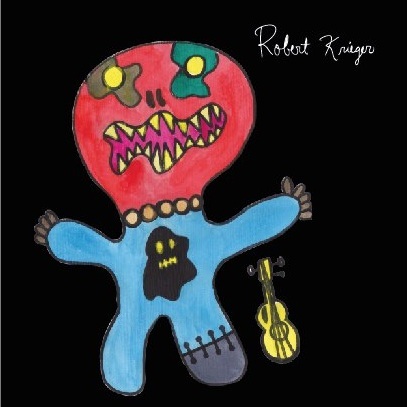 Robert Krieger's been making secretive music since the late 1999s, Robert was formerly one half of musical double-act "Ange-Démon", with whom he released two acclaimed underground albums, "The Magic Days of Nothingness" and "A Week In Warsaw". In 2011 he loaded his Yamaha keyboards onto his percussion trolley, strapped on his sleigh bells, and released her first solo album, "Shame". ("There’s more variety, and more beauty, on here than most other albums are going to show this year" Plan B; "He has now gone solo, taking with him a striking voice and some of the most mesmerizing tunes on the circuit... track after track of blinding excellence... A spectacularly wonderful range of vocal cuts and rather amazing tunes make this Krieger’s finest hour.” Constellation; ""The solo artist he now is should get all the attention that should be coming his way because of that pure wicked voice, the delicate songwriting involved and his sometimes hypnotizing performance." Mark Black). He is part of the spooky dreamy folk duo Mad Birdies, together with Mono-Drone (Massimo Amato), which have their first two albums released on Mahorka. He is also one member of The Mad Birdie Orchestra, (with Marco Lucchi, Gustavo Puente Lopez, Amos Ungar,Lee Negin, Massimo Amato, Jurica Jelic, Finglebone, Magdalena Solis,Djentrification, Roberto Téllez, Luca D'Alberto and Ana Cordero Reis), whose debut record "Evil Eggs" came out in 2009. Robert is currently recording the the new Mad Birdie Orchestra record titled : "1928".